Having been writing about credit cards and blogging for a while, I was very interested to find out how other personal finance bloggers have been using credit cards. So back in March, I came up with a list of questions that I decided to ask other bloggers. I started contacting people for a couple of months and finally am able to put the finishing touches to this. In total I sent out about 150 emails to various personal finance bloggers. I have tried to reach out to as many bloggers as I can, but I am sure I have missed a few of you. If I have, please send me an email through my contact form. First, a brief word on how I contacted the all my fellow peer bloggers. I first started with bloggers who were on my yahoo rss feeds. I started with the Money Blog Network which was started by 8 very high profile bloggers who I must say were pioneers in the personal finance space. I then followed, the blogrolls from the various bloggers. I also checked out recent participants of the Carnival of Personal Finance, the Carnival of Debt Reduction, and the Festival of Frugality. What gives this survey credibility is the fact that many prominent pf bloggers have responded to my survey questions, folks like JD Roth from Get Rich Slowly, Trent from The Simple Dollar. In total, 45 bloggers responded though not all answered every question. 1. How many credit cards do you have? 2. Which credit cards do you have? 3. Do you have any credit card debt? If yes, how much? 4. What rate are you paying on your credit card? 5. What is your credit score? 6. 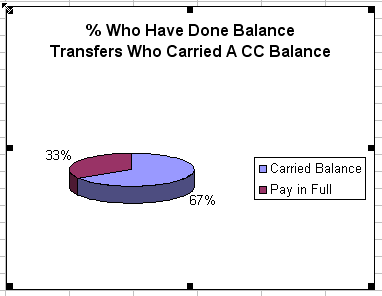 Have you got any credit cards solely for balance transfers? 7. If yes, what are the balance transfer credit cards you chose? 8. 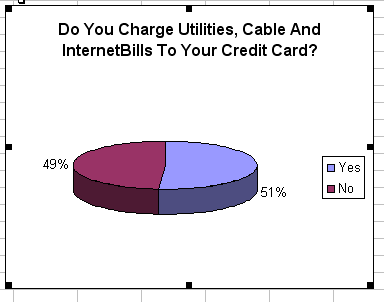 Do you charge your utilities, cable bills and internet bills etc to your credit card? 9. Is your credit card bills set up such that it is automatically paid every month? 10. 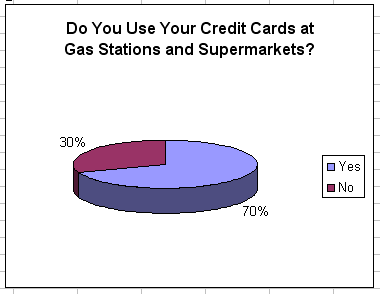 Do you use your credit cards at gas stations and supermarkets? But before I go on, here is an executive summary for those who just want to get some conclusions out of this survey. The main conclusion from this survey is that most pf bloggers make good use of their credit cards and could teach us a thing or two about credit cards. Firstly, most (50%) only carry two or three credit cards and do not go crazy over having many credit cards. 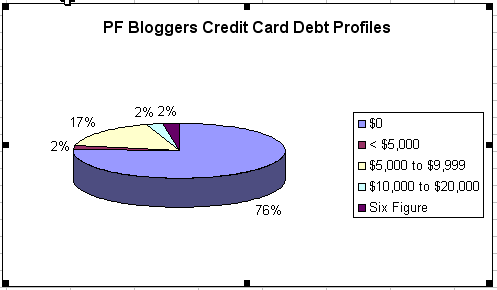 The majority of pf bloggers do not have credit card debt and also have credit scores over 700 (which is good). They also make use of their credit cards to get rebates or earn reward points by using them at places like gas stations. Most PF bloggers who carry a balance and have credit card debt take advantage of 0% APR teaser deals to help them lower their interest cost. Most carry credit cards from well establish credit card issuers and cite Citibank and American Express as their two favorite credit card issuers. 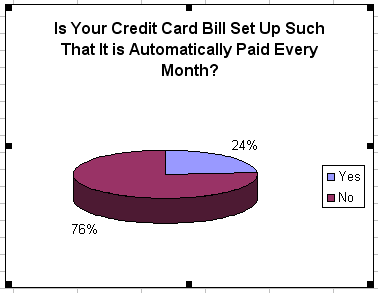 Below are the analysis and answers to the questions that I asked in the credit card survey. The first question I asked was how many credit cards you do have? Before I present my findings, here is my answer. I have 4 credit cards, the Blue Cash (mainly for my personal spending), Amex Platinum Card (out of my ego and to see how great this card really is and for our business), the Chase Flexible Rewards Card (because Chase does not publish their reward program on their site!) and most recently the Merrill Lynch Plus Visa (once again to check out the reward program). So here are the key findings. 34% of those who took part in the survey carried 2 credit cards . 16% had 3 credit cards. 14% had 4 credit cards. What is more interesting is that 7% had 10 or more credit cards! There were 2 bloggers who did not carry any credit cards. The Pie Chart Below gives a different view. Which Credit Cards Do You Have? When I first thought about the questions that I thought I should ask, I obviously thought about asking which credit cards do people have. Well, most listed all the credit cards they have, some did not and some were vague (like Amex or Visa). Then, when I listed all the credit cards that bloggers told me they had, I realized that it was just not feasible to list every card. So instead, I have decided to list the cards that most of the survey participants had (compiling this list was a nightmare to say the least!). Do you have any credit card debt? If yes, how much? 41 bloggers responded to this question. 31 do not carry any debt (that’s a whopping 76%). 1 blogger have credit card debt that was less than $5,000. 7 bloggers had credit card debt between $5,000 and $9,999. One blogger had credit card debt between $10,000 and $20,000. To be honest, I’m not sure that this is exactly indicative of the universe of personal finance bloggers since not every person that I sent an email to responded. But nevertheless, I think it is great news that the majority of the bloggers that responded do not have any credit card debt. What Rate Are You Paying On Your Card? For this question, I have decided to list the APR of those who actually carry a balance (ie have credit card debt). 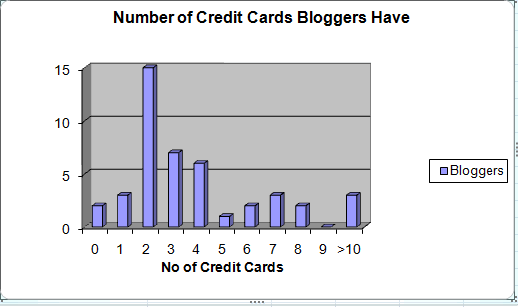 7 bloggers are presently now paying 0% APR on their credit card/s or at least on one of their cards. 4 bloggers were paying single digit APR. 4 bloggers were paying rates above 10%. 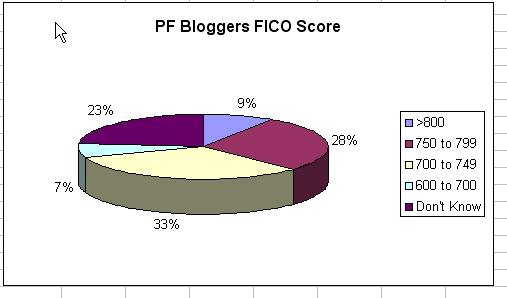 Of the bloggers that responded to the survey, 4 had credit scores of 800 and above. 12 had scores between 750 and 799. 14 had scores between 700 and 749. 3 had scores between 600 and 700. 5 did not know their credit scores! 5 bloggers were either overseas bloggers (or who had lived outside the US for a long time that they either do not have or have not checked their credit scores). It is good to know that at least three-quarters of the those surveyed had credit scores of 700 and above. 6. Have you got any credit cards solely for balance transfer? 15 of the out 40 bloggers had got credit cards solely for balance transfer purposes while 29 have not got any credit cards solely for balance transfer deal. Here are the list of credit cards that these bloggers used for their balance transfer. For this question, I got 45 responses. And it was evenly split. 22 bloggers did not pay their utilities, cable bills or internet bills with their credit card, while 23 actually did use their credit cards to pay all of the above or at least some items like cell phone bills etc. Only 10 bloggers who participated in the survey have their credit card bills set up such that their bills are automatically paid every month from their bank account. 32 bloggers do not have their credit card bill payment automatically set up with their bank account. One blogger (who obviously carries more than one credit card) has some but not all credit cards set up for automatic payment. The most common reason given was that they would personally like to check their statements and make sure it is correct (can’t argue with that one). 30 bloggers responded yes to this question (which I expected). Of the 30 that said yes, 3 said they specifically used it for gasoline purchases. 13 bloggers responded no to this question and do not use their credit cards at the gas station and supermarket. 2 bloggers said they used their debit cards for gasoline and supermarket purchases. I am inclined to classify that as a “No” simply because the purpose of this question was to see if people took advantage of using credit cards to earn rewards or rebates since credit card issuers tend to give more rewards or rebates when you use your cards for gas or grocery shopping. Not everyone answered this question. There were also no clear favorites here. This is understandable given that we have so many credit card choices. Below are some cards mentioned as favorites. 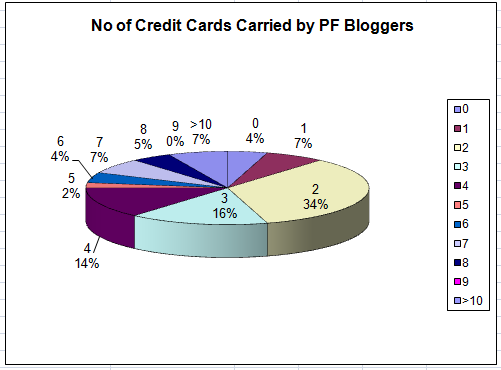 Here is the list of bloggers most favored credit card issuer ranked according to the number of votes. Some did not answer this question (either have no opinion or hate credit cards?). 1. Citicards – We have 8 votes for Citibank which makes it the most popular among the pf bloggers that participated in this survey. 3. USAA – This one caught me by surprise, but with 4 votes, USAA takes 3rd place. 4. Chase – 4th was Chase with 4 votes. 5. Discover – in 5th place is Discover with 2 votes also. 6. Bank of America (FIA) – with 2 votes. I’ve left the rest out the ones with only one vote. 13. When did you get your first credit card? What was the card? On hindsight, I should not have asked this question because most of the bloggers cannot really remember. Most got them in college (they think) and cannot remember the exact card. So I will not actually tally up the answers here (bad question on my part! – but how I am to know in advance?). 1> Under “How Many Credit Cards do you have?”, zero is not an option? So for folks who have none, were those results thrown out? It’s ok if they were, but that should be noted. 2> Under “Executive Summary”, maybe the intent is correct but not the wording. You note that “Most PF bloggers who carry a balance and have credit card debt take advantage of 0% APR teaser deals to help them lower their interest cost.” By my count, your chart shows 6 with 0% and 8 with an APR > 0. 0% is the most in one category, but not the majority overall, which seems more important here. 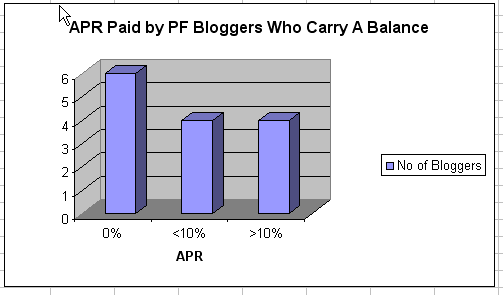 In fact, you show 4 bloggers carrying a balance with an APR 10% or more, which seems like a much more interesting finding. 3> Also under “Executive Summary”, you note that “…most only carry two credit cards and do not go crazy over having many credit cards.” The second part of that statement is an opinion, and doesn’t belong there. Two cards IS crazy to me, let alone 3 or 4. 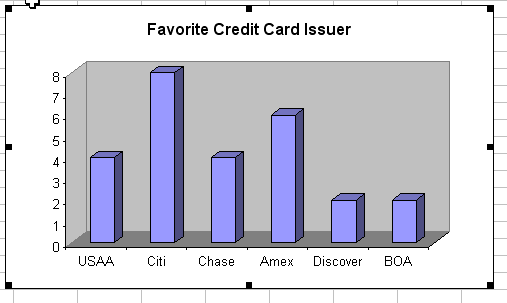 Once again, 2 credit cards is the most of any one category, but the majority actually have 3 or more. In fact, the amount that have 2 cards is equal to the amount that have 4 to 10 cards. Also where is the line of having gone “crazy over having many credit cards”? 3? 4? 10? Maybe I just look at the results differently. I agree that 0 should of been an option, especially with a growing segment of 0 debt bloggers out there! Regardless, this was a very thurough and well researched report and offers a very interesting glimpse into the varying habits of personal finance bloggers! Thanks for your comments. After reading what you wrote, I checked my data again and realized there was an error in the post. Yes, there were a couple of bloggers that do not use any credit cards. I have made the changes in the charts for the first question to reflect that. I still stand by my conclusion. Making use of credit cards at gas stations to earn rewards for example is IMO making good use of credit cards. Awesome survey! Thank you so much for putting this together and including my stats!! The USAA Platinum Card rocks! I wasn’t in the survey, but I actually have 2 of them! haha…. one for personal stuff, and one for all other stuff (like house, utilities, etc). This was pretty cool to look at though, thanks! Interesting results. I was surprised by some of the cards that rose to the top. I’ll have to check them out. With Delta about to change their FF program, it may be time to switch rewards cards. Wow! You did a lot of work on this one. The results are not surprising given the nature of the participants in the survey. I look at my own situation and it is pretty similar to what you report: 4 cards, no balances, Amex Blue & Citibank reward cards – used wherever credit cards are accepted to increase the cash back. I never actually checked my credit score – I can’t bring myself to pay for the privilege – but I check our credit reports every 6 months or so to make sure all is well (it is). Since we have never missed a payment on anything (except for a couple of 2 or 3 day delays when we forgot to make a payment), I expect the score is at least decent. Good job on the detailed report. Great post – well researched and put together.